So here’s my beef with summer: it’s too hot to drink coffee! I know, you coffee purists out there are thinking I’m crazy. And I’m not saying that I don’t drink coffee in the summer, because I do. I just can’t enjoy it nearly enough during the heat of the summer months as I do in the dead cold of winter. Last summer I was training for a half marathon and the LAST thing I wanted after coming inside from a run in 85% humidity was a piping hot cup of coffee. And this summer I find myself not even drinking a cup until I get to the office. That is, unless I just happen to have some cold brew in the fridge. I have drank coffee for as long as I can remember…my kindergarten self learned to drink it on Saturday mornings with my Grammy. She drank it black, and so does nearly everyone else in my family. She also drank it liked it best when she was eating a chocolate chip cookie with her coffee…she dunked her cookies into the black coffee and to this day, I would rather dunk my chocolate chip cookies in hot coffee than milk. We had some bad storms earlier this week and they left us without power one night. And the next day, even after the power came back on, we were without AC for sometime. So again, coffee was far from my mind. Except the coffee I sneaked into this Cookies & Cream Coffee Milkshake. I know it’s not chocolate chip cookies, but it’s certainly the next best thing. 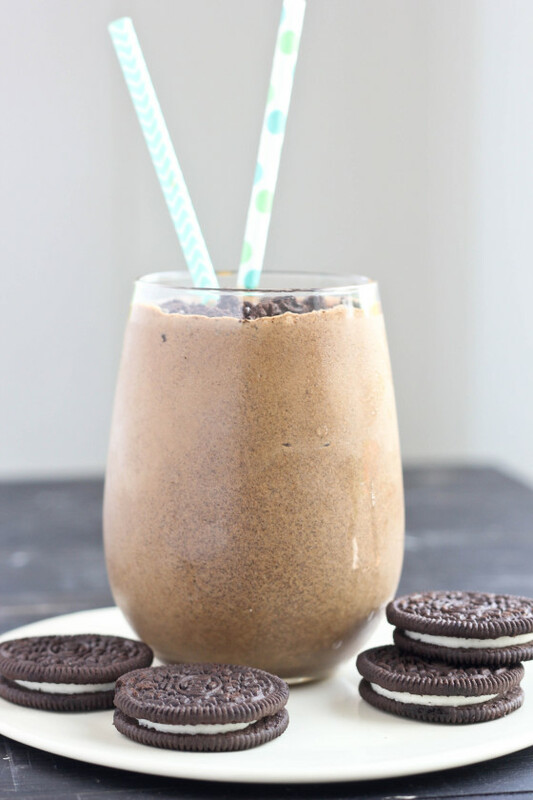 And these milkshakes couldn’t be simpler – coffee ice cream, Oreo cookies, instant coffee and a splash of milk. And there you have yourself the perfect summer alternative to a hot cup of coffee. After all, it is #MilkshakeWeek! Julie & Lindsay are always thinking up something fun and this time, it was a week dedicated to bloggers posting new milkshake recipes. They even teamed up with KitchenAid & Florida Dairy Farmers to offer a fun Milkshake-themed giveaway. Check out their links for details. And don’t miss Julie’s and Lindsay’s Milkshake Week Giveaways. 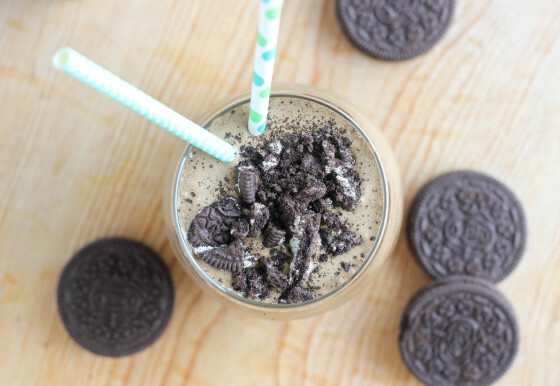 A sweet summer milkshake with Milk's favorite cookie - Oreo's - and a double-shot of coffee flavor from instant coffee granules & coffee ice cream. Combine all ingredients into a blender and turn on the blender; blend until combined – about 30 seconds. Serve immediately with a little crushed Oreo cookies on top, if desired. I love my morning coffee, but I agree Cassie – sometimes it’s too hot! I have to try this milkshake ASAP. Have a great weekend! Cookies and cream is my favorite flavour combo!! 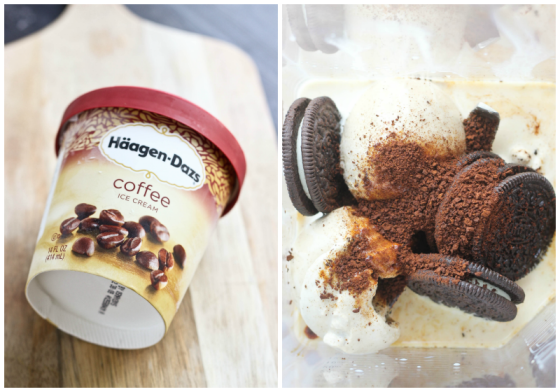 I LOVE the coffee ice cream used here…so smart! Just gorgeous! Love the simplicity. Have an awesome weekend Cassie! oh heck yes! This looks perfect and I love the photos! Wow! All my favorite things in a slurpable form! Yum! Ahh these are perfect! I love HD’s coffee ice cream too! My first taste of coffee ice cream mixed with Oreo was in Oregon!! You remember that ice cream shop? I NEED one of these! Whoa!! I need to this breakfast right now!! Looks amazing!!! I love all things cookies and cream! WHat are instant coffee granules? Not just coffee grounds? Is there a certain brand? Hi Allison, instant coffee granules are just freeze-dried coffee grounds. You mix them with hot water for a cup of coffee…we use them a lot when camping. You can buy them in the coffee section at the grocery store. I personally prefer Trader Joe’s brand but Folgers actually has a great one, as well as Starbucks. Enjoy! Perfect flavors for a milkshake! Definitely needed on a hot day! Yes to chilled coffee during summer! Loving this milkshake, Cassie! Ooooooo lady, this milkshake and I are totally MFEO. Love! In college, there was a place on campus that served the best milkshakes and my absolute favorite was called The Bomb.com and it was oreo and coffee!! This is the best flavor combination! Love this! so I’m not huge on coffee, but I can definitely get behind a coffee milkshake, especially when cookies and cream are involved. yum!! I’m not a huge coffee drinker, probably because it’s too hot here in AZ half the year to drink it so I feel ya. I could certainly drink a coffee milkshake though! 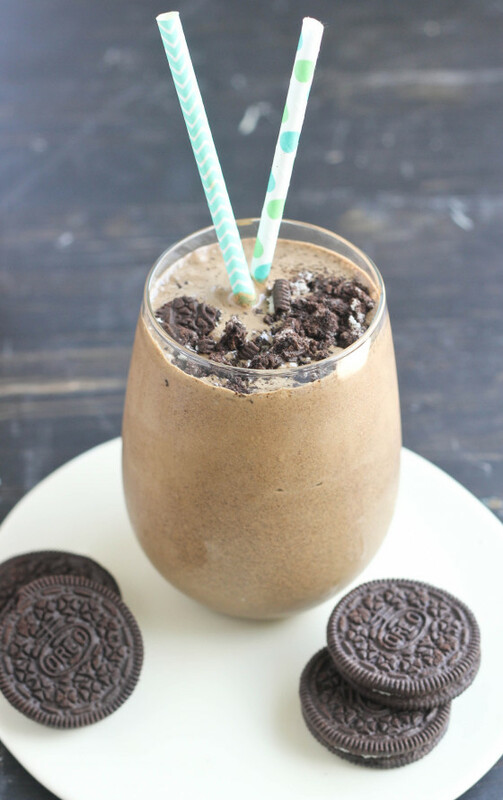 Love the combo of Oreos and coffee, so fun! Anything with coffee is happiness in my book, this looks SO GOOD! Our family made your Milkshake this weekend. Our local store had the ice cream on sale, and it seemed like the perfect time. OMG, did it ever hot the spot, we all loved it. I’m honestly one of those weirdos who is totally okay drinking hot coffee in warm weather. But I realize I’m an anomaly. 😛 And I will never turn down coffee in milkshake form!